You’ve allied with a faction, found all of Cayde-6’s loot and snared yourself some beautiful Exotics but you still can’t get enough. Destiny 2 well and truly has its space claws in you. While you unfortunately still need to live on real Earth as well as the EDZ there’s plenty of Destiny 2 merchandise out there to ease the pain of not constantly holding your MIDA. 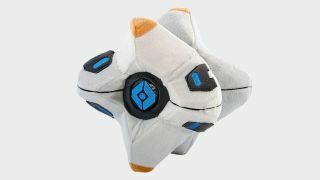 From T-shirts to plush Ghosts, there’s chestfuls of real life loot to make your day to day a little more like something Hawthorne would approve of. Happy shopping, Guardian. As satisfying as an intense, eight-hour Destiny binge can be (you can tackle the Raid AND Nightfall in that time), all that sitting around and sweating can leave you rather pungent. Been eating snacks too? Have some of them pooled on your lap? Go have a shower, for god’s sake! And once you’re done, why not slip into one of these delightful Destiny bathrobes. There are two designs, one with Guardian symbols and the other with the Raid motif on there. Mmm… you can almost feel the super-soft fleece caressing your (clean) face as you pick up the pad and head to the tower to decrypt all those hard-won Engrams. Of course you can get Funko Pop versions of Cayde-6, Ikora, Lord Shaxx, Zavala, and Oryx and of course they’re ridiculously adorable. D’awwww, wook at the wittle Taken King! Sure you already have a full set of them for another franchise but this is Destiny we’re talking about so you’re just going to have to find space in that glass cabinet (Vault of Glass?). Whether you take them out of the box is entirely up to you but you don’t want Cayde-6 to go all Stinky Pete from Toy Story 2 if he’s cooped up in there too long. There’s not even a chicken for company. If you’ve been one of the patient ones who has managed to resist playing on consoles, congratulations, you definitely deserve Razer’s range of Destiny 2 PC accessories. Razer’s slick Deathadder Elite gaming mouse has had a Guardian-influenced paintjob, while the already lovely Ornata Mecha Membrane gaming keyboard with wrist rest now has a lovely Destination Map design. And don’t worry if you haven’t got a PC, the Razer Man O’War Tournament Headset works with PS4 and Xbox One, and comes with the slick Destiny 2 logo on each earcup as well as 7.1 virtual surround sound and thumping 50mm drivers. What better way to to hear that thrum of Graviton Lance? Throw in the mouse mat and the whole kit is fit for a Guardian who has done their waiting. Until the Traveller arrives and grants us our own Ghosts for realsies, you’ll need to improvise a little to achieve that ‘Guardian 24/7’ look. These plush Ghosts will help you do just that. They’re actually larger than you might think, and are meant to be to-scale, so you can easily use them to knock up a decent Cosplay outfit, or just have one to snuggle up with at night when you’re dreaming about loot chests and Exotic drops. They’re also the perfect gateway into Destiny for (pushy) parents who are determined that their little spark of light will someday create a Guardian (and an Alt) of their own. What could be more festive than a bit of Destiny? Ok, admittedly, most things are more Christmas-y than high powered Exotic weaponry, Ghosts, and Zvahla’s dead-pan, blue-faced gaze. But for the Destiny fan who wants to embrace the festive season there are these delightful Christmas baubles, made from tin and featuring some classy iconography from the game. You get six balls in each box, and designs feature class symbols, Ghosts, and… oh god is that the terrifying skull from the ‘Darkness consumes you’ screen? Bloody hell. Oh well, it’s guaranteed to scare any toddler into being a good boy or girl for at least the whole of December. Oh, Sweeper Bot, we love you. Eternally polishing the tower, even as the concrete tumbles around it, the Sweeper Bot is the true hero of Destiny with its tireless approach to cleanliness. You too can celebrate its constant quest for a dust free world with this official Bungie unisex tee that comes in the appealing colour of ‘rust.’ Plus, no one will know you’re wearing a Destiny shirt unless they glimpse the tiny logo on the back. Stealthy nerdery for the win. If you’re missing Lord Saladin and his ultra-cuddly wolves, fret not, you can have them in your room 24 hours a day. A ThinkGeek exclusive, this officially licensed figure comes complete with detailed Iron Banner accents and is a dinky 4” tall. The last of the Iron Lords also comes with two somewhat furious looking wolves. Are you up to the challenge of dusting them regularly? The Traveller doesn’t just make Guardians feel better by returning their Light after Gary stole it, y’know. It can help you too. Bad day at the office? Squeeze the official Destiny 2 Traveller Stress Ball and your inner peace and light will gradually return to you. Alternatively, squish it in fury as you load up the Nightfall for the tenth time, only to beat it with 4 minutes and 59 minutes to go and missing out on the Rat King Exotic sidearm yet again. Just remember to breathe, eh?